The Newark Public Library will be showing the last of its three films in its Environmental Film Festival this Saturday. The Festival has been great so far, with informative films and lively discussion. This last event promises to be a fantastic closing event. 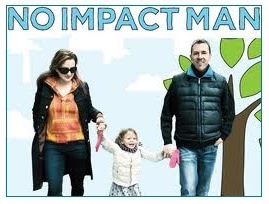 This weekend's film is titled No Impact Man. It follows one man, Colin Beavan, along with his family, on their journey to live in the middle of New York City with as little environmental impact as possible. The No Impact project has been the subject of stories in the New York Times, the Christian Science Monitor, and many other national and international news outlets. Beavan has appeared on The Colbert Report, Good Morning America, Nightline, The Montel Show, and all the major NPR shows. He speaks regularly to a wide variety of audiences, is frequently quoted in the press and consults to business on the intersection of sustainability and human quality of life. The event is this Saturday, October 9th, at 7 pm. Tickets are free of charge and will be given at the door. Make sure to arrive a little early so you can grab a good seat! Delicious refreshments will be provided, and the film will be followed by a time of enlightening discussion on the topics of the evening. We hope to see you here! For more information on the Environmental Film Festival, please visit the official website at bit.ly/libraryfilmfestival. 0 Comments to "Environmental Film Festival wraps up this Saturday"